Compact recurve horse bow was widespread all over Europe and Asia. Due to not great size and high speed of shot, such bow glorified horse archers. This model of bow is made of double glass pane on the wooden base. Leather dampers are installed on the both bow limbs. Using of modern materials provides with durability of bow. Besides, these bows are light, firm and have perfect draw weight. 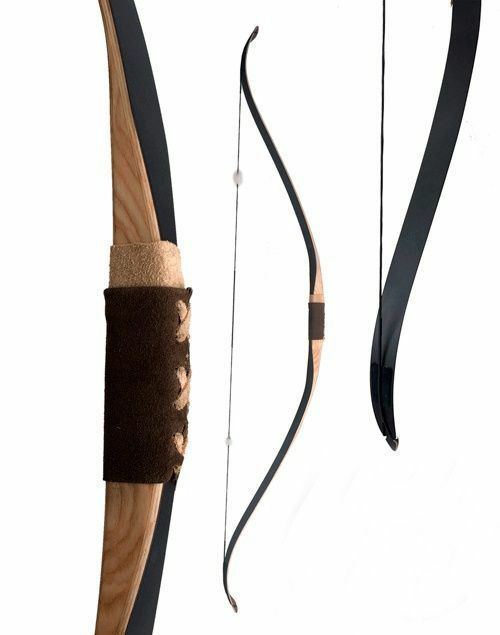 We recommend to use such bows for mount or dismount archers from 16 years old. Bow is completed with dacron arrow string and carrying bag. 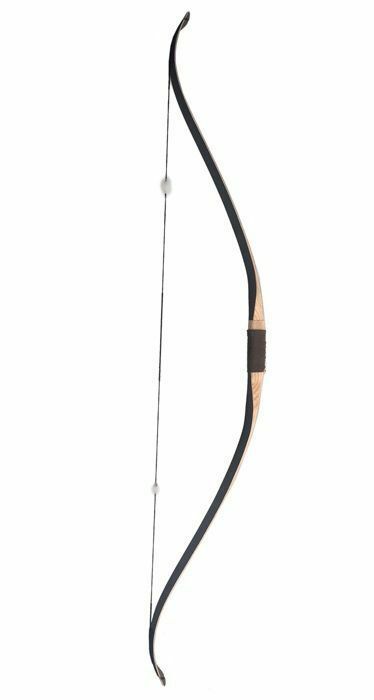 This short recurve bow combines the best qualities of few eastern bows: shape of Scythian bow (father of recurve bows); curve of bow limbs is close to late Turkish bows; similar length was typical for Tatarian bows. Bow is compact and easy-to-use. It is made of wood veneer and double glass pane by the modern methods. . Bow limb is active throughout the length. It is typical for modern recurve bows (both, sport and hunter). We recommend to use such bow experienced archers from 16 years old. As archery requires advanced level of skills. Main characteristics: Length: 130 cm Extension: 75-80 cm Draw weight: 16-20 kg Direct flight: 35-45 m Flying range 45°: 95-180 m Arrow string: dacron. These types of arrows can be used with such model of bow: - arrow with painted fletching 75 cm and 80 cm; - arrow with goose fletching 77 cm and 81 cm; Bow is supplied with dacron arrow string and carrying bag. ..
First prototype of modern longbow was invented by famous archer Howard Hill in post-war years in USA. High accuracy and stability of shot and smooth extension made this bow very popular among the archers. Bow is hand-crafted of double glass pane. It is acceptable for experienced archers and newcomers from 16 years old. Main characteristics: Length: 155-162 cm Extension 75-80 cm Draw weight: 17-20 kg Direct flight: 30-40 m Flying range 45°: 80-160 m Arrow string: dacron Orthopedic handle Arrow rest We recommend to use this bow with such types of arrows: - arrow with painted fletching 60 cm, 70 cm and 75 cm; - arrow with goose fletching 60 cm, 70 cm and 75 cm Bow is supplied with dacron arrow string and carrying bag. .. This model of bow is recurve one. Complex Asian bows (medieval bow Hankyu in particular) formed the basis of this bow. Technology of gluing of two different sorts of wood (ashwood and bamboo) was used for crafting of Sanmaiuchi bow. We use the same method, creating our bows. Highest draw weight, good accuracy, reliability and flexibility of bow are main peculiarities of such bow, because of bamboo lay. Bows of this type are more powerful with equal draw weight, comparing to straight bows. Main characteristics: Length: 150 cm Extension: 70-75 cm Draw weight: 17-20 kg Direct flight: 30-40 m Flying range 45°: 130-150 m Arrow string: dacron We recommend to use this bow with such types of arrows: - arrow with painted fletching 60 cm, 70 cm and 75 cm; - arrow with goose fletching 60 cm, 70 cm and 75 cm Set includes carrying bag. ..
This​ ​model​ ​is​ ​a​ ​replica​ ​of​ ​straight​ ​enforced​ ​bow.​ ​ It​ ​combines​ ​two​ ​different​ ​sorts​ ​of​ ​wood.​ ​Hard​ ​ashwood​ ​is​ ​used for​ ​inner​ ​side​ ​and​ ​elastic​ ​bamboo​ ​-​ ​for​ ​outer​ ​side. As​ ​European​ ​warriors,​ ​so​ ​Asian​ ​archers​ ​used​ ​such​ ​type​ ​of​ ​bow. Technology​ ​of​ ​glueing​ ​of​ ​bamboo​ ​and​ ​ashwood​ ​was​ ​borrowed​ ​from​ ​early​ ​Japanese​ ​(Fusetake)​ ​and​ ​Chinese bows,​ ​until​ ​complex​ ​compound​ ​Mongolian​ ​bow​ ​has​ ​appeared. Main​ ​characteristics: Length:​ ​150​ ​cm Extension:​ ​65-75​ ​cm Draw​ ​weight​:​ ​13-16​ ​kg Direct​ ​flight​:​ ​20-30​ ​m Flying​ ​range​ ​45°​:​ ​70-90​ ​m Bow-string:​ ​dacron Handle covered with natural leather Arrow​ ​rest We​ ​recommend​ ​to​ ​use​ ​this​ ​bow​ ​from​ ​10​ ​years​ ​old. These..
English battle longbow formed the basis of this model of bow. Longbows in the hands of experienced professional archers glorified English army in times of the Hundred Years’ War. First English bow had being made of yew-tree. This tree has such typical features: hard heart and elastic sap. Because of such wood features, not too expensive, but effective weapon could be made. Later, armourers started to glue two layers of different sorts of tree, when making longbows. This method improved efficiency and durability of bows. We use the same method, creating such model of longbow. Two layers of ashwood are enforced with bamboo throughout the length of bow. As bamboo is high-tense wood, it is the most popular for making of longbow replica. Good elasticity and high speed of shot are typical features for bows, which are enforced with bamboo. Bows, which are enforced with bamboo, We recommend to use such bow from 16 years old. Main characteristics: Length: 170-180 cm Extension: 75-80 cm Draw weight: 17-20 kg Di..